2:30 pm: NIA chief has announced that HuJI has sent mail claiming the responsibility of Delhi blast. The mail is being seriously looked at. 2:10 pm: Delhi govt announces compensation: Rs 1 lakh compensation for those seriously injured and Rs 50,000 for those who sustained minor injuries. Congress leader Abhishek Manu Singhvi addessed the media outside the court. He said, "this is a terrible tragedy. This is something which is shocking and numbing. Our hearts go out to each litigant. They've come with great pressure and to be torn away suddenly out of the blue is terrible. Delhi CM visits the injured in RMLhospital and says doctors are doing the best they can. Dr Singh said that all political parties and people of India must stand united. The PM is expected to return to India this evening. Major metros of India have been placed on a state of high alert after Wednesday morning's explosion outside gate number five of the Delhi High Court. A decision to this effect was taken at a meeting of senior Home Ministry and police officials. The emergency meeting was chaired by Union Home Secretary R.K. Singh. With today's bomb explosion outside the Delhi High Court, the number of terrorist attacks on the capital since 1997 has gone up to 30. Among the most recent incidents, 59 people were killed and 155 injured during the October 18, 1997 serial bomb blasts that ripped through the markets of Sarojini Nagar, Paharganj and Govindpuri. On September 13, 2008, five low-intensity explosions were set off within minutes of each other, beginning with Ghaffar Market, two explosions at Connaught Place, one at Barakambha Road and another near the Central Park Metro station at 6.31 pm. Blasts also rocked M-block market in Greater Kailash-I. Within seven minutes another bomb exploded in the same market. Twenty-five people were reported killed and 150 injured. On September 27, two men on a motorcycle dropped a polythene packet containing a low-intensity explosive in the crowded Flower Market in Mehrauli. Three people, including a nine-year-old boy who picked up the bag, were killed and 21 people were injured. On September 19, 2010, two armed men opened fire at Taiwanese tourists as they boarded a bus in the crowded Jama Masjid area. A Maruti car also went up in flames near the mosque, triggering panic. No casualties were reported though 14 injuries were claimed. The attack came two weeks ahead of the Commonwealth Games. Dr Manmohan Singh says the terror strike is a "cowardly act". Meanwhile, Delhi CM Sheila Dikshit visits at the RML hospital and HM Chidambaram visits the blast sight. Hindustan Times tweets, "4 kg explosive used for the blast, crater of 4x4 feet formed at the site: reports"
Union Home Minister P. Chidambaram on Wednesday told Members of Parliament that the capital city of Delhi had been targetted again by terrorists, and that a nation-wide security alert has been issued following the explosion outside gate number five of the Delhi High Court. Reading out a statement in the Lok Sabha, Chidambaram said the number of dead was nine and that the injury toll was 47 as per latest reports from investigating agencies and hospital officials. He described it as a tragic incident and added that the government condemned it in the strongest possible terms. Offering the government's condolences to families of the dead victims and the injured, he said that no effort would be spared to pursue the perpetrators of this horrific crime. He also said that with parliament and other important institutions being in Delhi, the national capital is being targetted. He said terrorist groups were trying to destablise the state and should not be allowed to succeed. In his statement, Chidambaram said the investigation into the blast has been handed over to the National Security Guard (NSG) and the National Investigation Agency (NIA). The SWAT team and the bomb disposal squad are also at the site to search for key clues, he added. Chidambaram said that his ministry has ordered a multi-pronged probe into the incident. Senior Bharatiya Janata Party (BJP) leader L.K. Advani said that the opposition was one with the government in condemning this shameful incident, and hoped that the government would take appropriate steps to prevent such incidents from taking place in the future. He requested Speaker Meira Kumar to adjourn proceedings in parliament as amark of respect to the dead and injured. The explosion took place outside the Delhi High Court at around 10.14 a.m. Police officials and eyewitnesses said that the bomb components were found in a brief case. The death and injury toll was confirmed by U.K.Bansal, Secretary (Internal Security) in the Ministry of Home Affairs. Home Secretary R.K. Singh also presided over an emergency meeting of ministry and police officials and it was decided to place key metros on high alert in the wake of the blast. 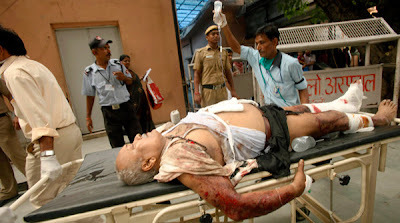 The injured have been taken to the Ram Manohar Lohia Hospital, the All India Institute of Medical Sciences and the Jayprakash Narayan Hospital for treatment. The area has been completely cordoned off to enable investigating agencies and others to assess the situation and the causes for the blast. Three CAT ambulances and several fire engines have arrived at the blast site. Top Delhi Police officials, including Police Commissioner B.K.Gupta are at the spot. They are in touch with Home Ministry officials, media reports said. The Home Ministry is also assessing the situation, the reports added. Gate number five is the main gate of the Delhi High Court from where most lawyers and litigants enter. Police described the blast as a medium to high intensity one. Special Commissioner Dharmendra Kumar said the number of injured admitted in various hospitals is at 50. Most of them have sustained leg injuries. BJP's Ravi Shankar Prasad: It is a matter of great distress...Why isn't the government taking any action? How many more deaths? There is no proper security, no intelligence inputs...We condemn the attack. CPI's D Raja: We condemn the attack in all possible terms...the government should come up with the right probe and share what went wrong... what is going on, what is wrong with our intelligence network? We strongly condemn this attack. Nobody should go scot-free. There is a failure on the government's part. Lok Sabha condemns the blast, is adjourned till 12:30 pm, reports HT. Times Now reports the MHA is in constant touch with investigative teams at the blast sight. The bomb was concealed in briefcase and place outside gate no 5. Early reports say the explosives were kept in a briefcase near the gate. Ten people were killed and at least 56 others injured. Most of the wounded have been taken to RML hospital. Medium to high intensity bomb used. He added that Delhi is on high alert and that investigations have begun. Besides the Delhi police and the forensic team, the NIA and NSG are also being rushed to the spot. A lawyer tells NDTV, that gate no 5 used to issue passes to litigants. He also said that 10 am is peak hour. Special home secretary tweets that so far four have been confirmed dead and 30 injured. Hindustan Times tweets that officials have confirmed four people have died in today's blast. This is the second blast in the Delhi High Court premises. On May 25, also a Wednesday, there was a low intensity blast. The blast happened in the area where people wait for passes to enter the court premises, said special officer Special Commissioner Dharmendra Kumar. A police officer at the blast area say there is a possibility that the bomb could have been placed in a briefcase. Delhi police have asked people to clear the High Court area. The injured have been taken to Safdurjung hospital and RML hospital. A lawyer present at the blast sight tweets, " Blast in delhi HC. Right in front of me. *shudders* the whole car shook" ..."The bomb was very powerful it seems. Everyone is outside. Lots of injured. The gates are closed now. Can hear sirens"...The bomb was very powerful it seems. Everyone is outside. Lots of injured. The gates are closed now. Can hear sirens"..."Many hurt. Building being evacuated. The Judges are themselves out in the corridor." The nature of the blast is yet to be identified. So far, two people are feared dead in the explosion, reports NTDV, while CNN IBN says the number of injured may be around 20. 10: 38 am: Police cordon off the blast sight, fire tenders rush in. Ambulance arrives at the explosion site. The number of injured is still not confirmed. The reason for the explosion is not known yet. Blast outside Delhi High Court. Television channels report of injuries to people. There are more people at the court premises than other days of the week since Wednesdays are when PILs are heard.